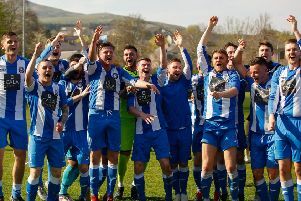 Aaron Somerville’s stunning strike maintained Penicuik Athletic’s position at the top of the East Superleague in a 2-1 win over Broughty Athletic. Cuikie took the initiative in the bitterly cold conditions with two consecutive corner kicks but the Fed defended them well before MacDonald fired off a shot from 20 yards that was deflected inches wide of the upright. From the corner, there was panic in the Broughty defence and a shot was cleared off the line. Then a Somerville header off a free kick went straight to keeper Sinclair. The home side’s pressure finally paid off in the 29th minute when a flowing move set up Jamieson who took full advantage to drill the ball past Sinclair. Minutes later, Sinclair had to be alert to dive down to his left to save a strike from the edge of the penalty area. Just before half time, Penicuik had another shot cleared off the line and the rebound was saved by Sinclair. Broughty came out for the second half with determination and were rewarded with an equaliser in the 51st minute. They broke through the midfield and the through pass set up Kessen who, despite Forbes’ best effort, chipped the ball over Allison as he rushed from goal. However, Broughty’s joy was short lived. Five minutes later, a MacDonald cross into the box was knocked down by Ponton to Somerville who volleyed the ball first time from the edge of the area into the roof of the net – a goal worthy of winning any game. Penicuik were now full of confidence and Jamieson came close minutes later, but Sinclair did well to deny the striker. In the 70th minute, Broughty had a chance, but the final effort on goal was comfortably saved by Allison. With Penicuik seemingly content to defend their lead, Broughty began to get more of the game and Clark saw his shot deflected away for a corner kick. From the corner, keeper Allison, under heavy pressure, rose to punch the ball clear for a throw in. In the 85th minute, with Broughty continuing to press, Allison was again in action saving low down to his left.